Easter marks the 38th anniversary of the program, and we return to our roots—chant and early medieval sacred music. I. 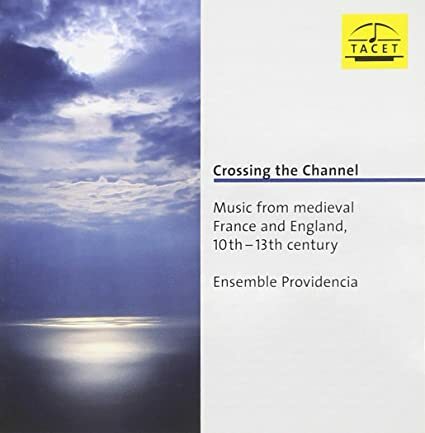 Crossing the Channel—Music from medieval France and England, 10th-13th Century (Ensemble Providencia). Tacet CD 201. Ensemble Providencia is a vocal quartet of two sopranos and two mezzo-sopranos, who specialise in music of the Middle Ages. Their intention is to present this music as a means of expression in our contemporary world. They research undiscovered repertoire and make transcriptions. These recordings were made in the Abbatiale of Beaulieu-sur-Dordogne. II. 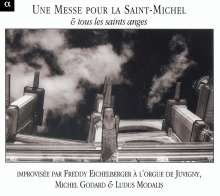 Une Messe pour la Saint-Michel et tous leas saints anges Ensemble Vocal Ludus Modalis/Freddy Eichelberger, organ of Juvigny-sur-Marne/Michel Godard, serpent.). Alpha Les chants de la terre (White label) CD 514. This recording reconstitutes the ‘Ordinary’ of a seventeenth-century Mass, during which the organ and the choir continuously respond, with parts entirely improvised by the choir as well as the organ. III. Ars elaboratio (Ensemble Scholastica/Rebecca Bain). Atma CD ACD2 2755. The work of musicologists and performers during the last few decades has significantly advanced the field of medieval music. There remains however a great deal to discover, and the question of authenticity continues to be a concern. Ensemble Scholastica seeks a new approach to these issues by exploring the medieval art of elaboration. Today, a musical work is considered a complete composition, the intellectual property of its composer. The concept of ownership with regard to a musical (or any other) idea was however utterly foreign to medieval people. Music and text were adapted to the needs of the moment and performer. While you were not allowed to tamper with the existing liturgy, between the 10th and 12th centuries it became common practice to add to it, musically and/or textually. The development of polyphonic composition, at least until the 13th century, is also a product of this trajectory. Plainchant could now include elaborated passages of 2, 3 or even 4-voice polyphony. Still, not all compositions were notated, some were even improvised, and virtually none of these pre-14th century composers supplied their names for posterity in part because none could claim to have composed the final version of a piece. Of course polyphonic composition was not meant to be done any which way, but was subject to constantly evolving rules. The medieval student of music likely internalized these rules thoroughly and practiced them often. Few if any musicians today however have learned them to the point of being able to practice them in the same manner. In fact, most modern performances of medieval music are of known pieces in their surviving versions. It could be argued however that, rather than limiting ourselves to the extant repertoire, it is equally authentic to learn and apply the medieval art of elaboration. 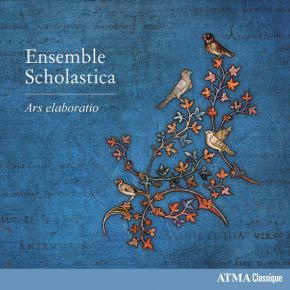 Ensemble Scholastica first began its experiments with the art of elaboration while preparing its "Birth of Polyphony" program in 2013. For a portion of this program (which we presented to an enthusiastic sold-out audience at the Festival Montréal Baroque/Médiéval), we followed the medieval rules of polyphony and composed several of our own polyphonic versions of surviving monophonic pieces. Since then, we've continued to learn other medieval elaboration techniques, and the result is an entire program of newly composed monophonic and polyphonic elaborations on medieval liturgical songs. Ultimately, our goal is to provide more insight into the world of medieval music by shaking up the normal rules of current historically-informed medieval music performance practice. On a more philosophical level, this project is also designed to invoke reflection with regard to our attitudes towards authorship, intellectual property, the space between performer and composer, and the relationship between historical and modern performance. Tacet CD 201, (White label) CD 514, CD ACD2 2755.